Motorola released new iterations of its Moto G series smartphones recently. With the new Moto G6 series, Motorola completely redesigned its smartphones. 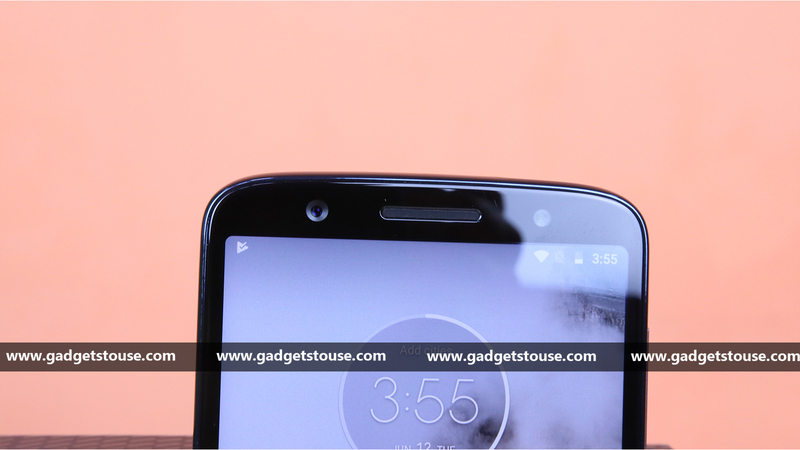 The Moto G6 which starts at Rs 13,999, looks premium with the 3D curved back glass. 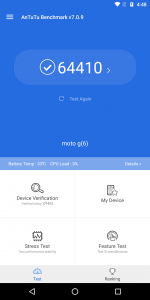 However, if we talk about hardware, the Moto G6 comes with an entry level processor and plenty of RAM to perform the way a smartphone should be. 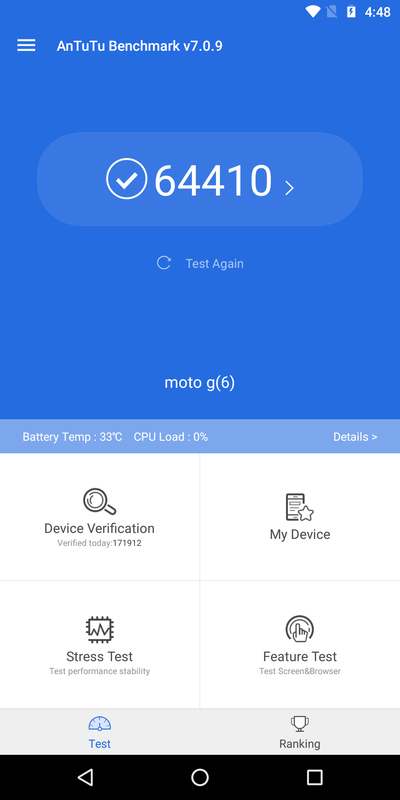 Let’s test the Moto G6 for performance and see how much horsepower we can extract from Snapdragon 450 running on stock Android user experience. The Moto G6 is a budget range smartphone which is powered by a Qualcomm Snapdragon 450 processor which is an octa-core CPU for smartphones. All the eight cores of the Snapdragon 450 are clocked at 1.8 GHz frequency. The processor is paired with 4GB of RAM and 64GB internal storage which is expandable via dedicated microSD card slot provided in the SIM card tray. The smartphone runs the stock version of Android 8.0 Oreo which comes with some smartphone related apps from Motorola. To keep all this hardware running for a whole day, Moto G6 is equipped with 3000 mAh battery. 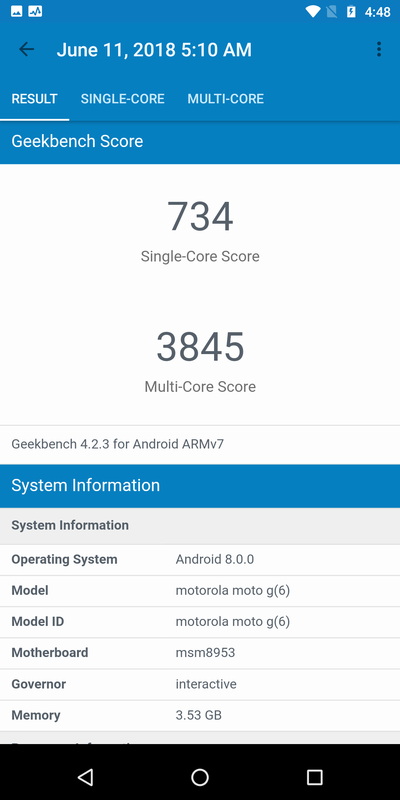 The Moto G6 got some decent results in AnTuTu benchmark and Geekbench 4.0, the score in AnTuTu is 64110. 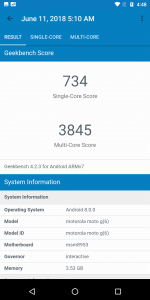 The single core score in Geekbench is 734 and multicore score is 3845 which is similar to the score of Samsung Galaxy S7 running the Snapdragon 820 processor. 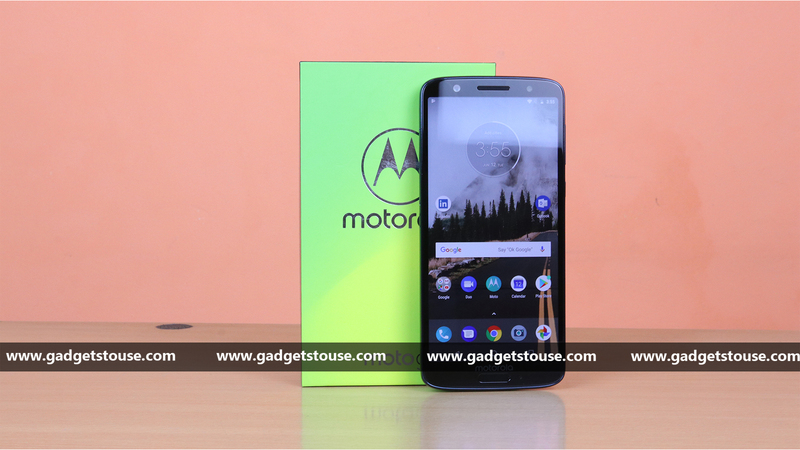 The Moto G6 is not a smartphone to run high-end games like PUBG Mobile but we gave it a try and the smartphone performed surprisingly well in the gaming. We even changed the graphics setting from “low” (which is the recommended setting from the game itself) to “medium” and still Moto G6 kept on performing well. Now, comes to other games like Asphalt 8 and Modern Combat 5 with no high graphics demands. These games ran smoothly too because of 4GB RAM and fast storage. The smartphone passed the performance test and packs quite a punch when comes to gaming performance. The smartphone performed great in gaming but how long can you play on this smartphone depends on the battery performance. So, according to our test, the battery drop rate even in high-end games like PUBG Mobile is very low. You can play 3 to 4 hours continuous with a fully charged battery. The battery in Moto G6 is 3000 mAh and it charges really fast with its Turbo Charge which operates on 3Amp max. The smartphone charges from zero to 70 percent in less than an hour which is quite fast for 3000 mAh battery. The Moto G6 is a great smartphone at this price point, the gaming is smooth and the UI is seamless, thanks to the stock Android interface. The smartphone performed smoothly in all conditions and it is completely worth every penny you spend on this smartphone. So, if you are a gamer, this might be the good device for you at an affordable price.